Passionate about cooking and want to share your knowledge? We have the perfect opportunity for you! 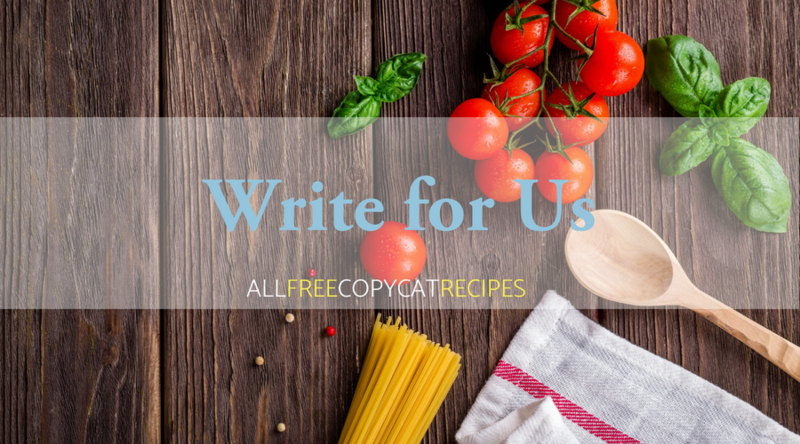 We're always looking for guest bloggers to write for AllFreeCopycatRecipes. You can choose your own topic, or you can reach out and ask an editor for a recommended topic. If you decide to choose your own topic, please select a topic that we have not already covered on our site. Articles should be a minimum of 600 words and a maximum of 3,000 words. Recipe/Tutorial should include an introduction of around 100 words. Recipe/Tutorial should include at least 1 high-quality photo of the finished product. Recipes/Tutorials with photos for each of the steps are preferred. Recipe/Tutorial should include a complete ingredients list and full instructions that are clear, thorough, and well written. The article's total word count should be 300+ words. To start the submission process, please send us a query via our Contact Us page. Please include a short description of your article, and we will contact you in 1 to 2 weeks with next steps if it is a good fit for our site. If your article or project is accepted for publication, you will then send all of the content and images needed and we will create the page. It may be lightly edited to meet SEO best practices. Our need for the recipe/tutorial. Editors will determine whether the demand is great enough for purchasing your article and whether the topic is unique enough (if we do not have something similar on our site already). Your ability to promote. By working with AllFreeCopycatRecipes, we offer you (the creator) heavy promotion. AllFreeCopycatRecipes has 101,988 email newsletter subscribers, receives 250,000 monthly page views, and has 116K Facebook followers. In order to buy content, we need to know how you can promote us in exchange. At the time you're pitching an article, please include the number of visitors your site receives per month, as well as the number of followers you have on social media (primarily Facebook, Pinterest, and/or Instagram). Our Networking Cheat Sheet is a great resource. You are always welcome to submit projects and articles via our Share Your Project feature. This is a great option to have your content featured on our website and shared with our reader, even if we decide not to purchase the content. You can either submit it as a full recipe with pictures, or you can submit it as a link-out so the reader would need to click through to your site for the full tutorial. Thank you for your interest in writing for AllFreeCopycatRecipes!